These days having a credit card is an almost essential accessory to being able to access the best deals, with cash and checks often seen as a outdated way of paying for purchases of any value. The reliance on plastic has seen a vast number of providers spring up; a simple check on credit cards at any comparison website will provide a long list of potential lenders. A recent trend has also been towards holding more than one card, but how many credit cards should you have? Is it a good idea to have many credit cards, or is this an indicator of underlying money problems? In the past, most people opted to have just one credit card, increasing their limit if they needed to up their spending power. However, nowadays it is far more common to have an array of plastic to pick from. One of the reasons for this is not just because borrowing has become more prolific and card use more mainstream, but because there are many different kinds of cards on the market that are better suited to different uses. As an example – what kind of cardholder are you? Do you pay off your balance in full every month? Or do you scrape by with just the minimum, paying off large purchases over several months? If you are the former, a credit card with either a low or 0% APR will be of little value to you, as you will never pay any interest on your purchases. A far better card to look out for would be one that either provides cashback or a good reward program, as this would actually mean you end up in profit when making purchases. If you fall into the latter group, whilst cashback or rewards would undoubtedly be a nice aside, they should not be the primary focus. Cardholders who opt to pay off the balance over longer periods of time are far better off looking for a card with a competitive interest rate that is held at a low level for a long time. However, in reality, many people are a combination of the two extremes, paying off smaller purchases in full but spreading out larger costs over longer periods of time. This means that a single card is unlikely to provide the best returns, as those with the best cashback or reward programs seldom offer a competitive interest rate too. It is therefore necessary to have different cards for different purposes – some with a low interest rate for long term spending and another with a better package for balances which are paid off in full each month. Another strategy that people adopt is to split their spending onto different cards; one for every day bills, another for auto expenses and so on. Whilst this takes some organization to set up, some people find it a better way to manage their finances and keep track of how much they are spending on everything. Another advantage of this is that it can make tax returns easier to do if you haven’t kept track of your costs properly throughout the year. 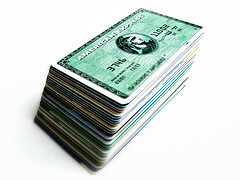 Whilst it can undoubtedly be of real value to hold more than one card, just adding to the collection because there is not enough money in the checking account is not a good reason and holding several cards with them all maxed out will act as a red flag on your credit file that there may be problems ahead.